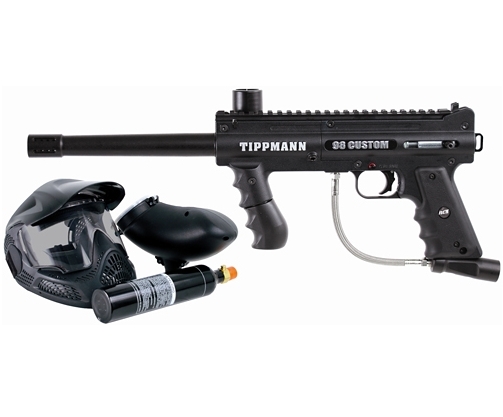 SKU: SKU20236 Category: Paintball Gun Packages Brands: Tippmann. The TippmannÂ® 98 Custom Platinum Series A.C.T. paintball marker Power Pack includes a marker, a 9-oz CO2 tank (CO2 not included), and a high-performance goggle with an anti-fog lens. The split receiver design of the marker provides easy access to internal components for simplified installation of grip upgrades and modifications. The redesigned, vertical front grip offers improved stability and added texture for a more secure feel. Â·	Allows you to shoot as fast as you can pull the trigger. Â·	Gives your maker increased accuracy and added noise reduction. Â·	Standard trigger that allows for quick firing.